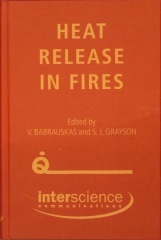 Heat Release in Fires – Fire Science and Technology Inc.
V. Babrauskas and S. J. Grayson, eds., Heat Release in Fires, Interscience Communications Ltd, London (1992; reprinted 2009). xii, 623 pages, illustrated, hardbound. ISBN: 978-0-9556548-4-8. The original book publisher was Elsevier Applied Science. The current reprint is from Interscience Communications Ltd.: ordering information. List price: £95 plus p+p (UK £4.50, Europe £8.00, Rest of world £14.50). Few booksellers carry this book (especially charging no more than the list price! ), thus it is recommended that it be ordered directly from the publishers.